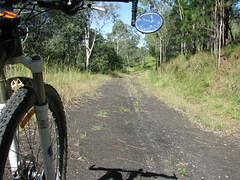 I thought I’d explore some quiet roads out the back of Dayboro this afternoon. It was a good excuse to get a few miles on the bike before I go for a huge ride with Simon tomorrow (weather permitting). 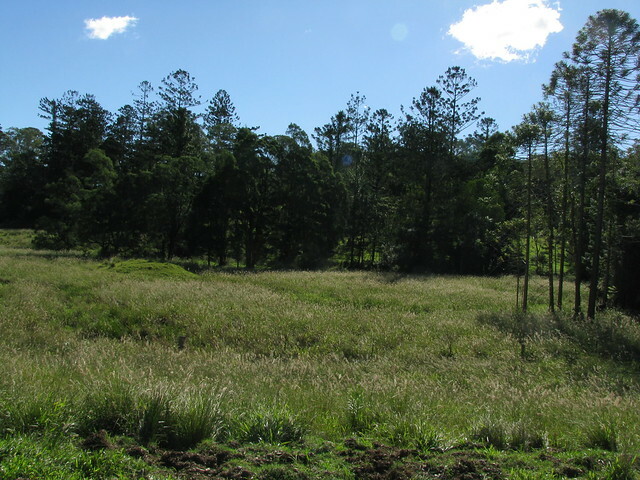 Rush Creek is one of those districts that figured large in the history of the Pine Rivers area. It was logged in the mid 19th century. William Henry Day (after whom Dayboro is named) planted one of the first sugar cane farms in South East Queensland using Kanak labour. Rush Creek Road was closed off in the 1970’s when the North Pine Dam was built, and local farmland was flooded. 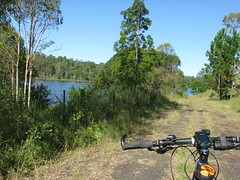 It used to be the main road between Petrie and Dayboro, and crossed Rush Creek at Whiteside / Quinns Crossing. That crossing disappeared under the man-made lake 40 years ago, and the road hasn’t been used since. It’s funny how you can still make out the double white line down the middle, under all the grass which is slowly reclaiming the land. I followed a dirt road over a cattle grid. It eventually turned into a vehicle track, and before I knew it I was in front of an old farm house. Will, the farmer, was really friendly and explained that the road reserve ran through his property and disappeared in the grass after a few hundred meters. He very kindly let me ride around and take some photos. I really liked these old Hoop (A.Cunninghamii) and Bunya (A. Bidwilli) pines along the banks of the upper reaches Rush Creek. The final road I explored was Strongs Road. The sign says it’s a “No Through Road” but it actually turns into a muddy vehicle track, and eventually comes out on Mount Samson Road – a much nicer ride than battling 100km/h traffic on Dayboro Road! 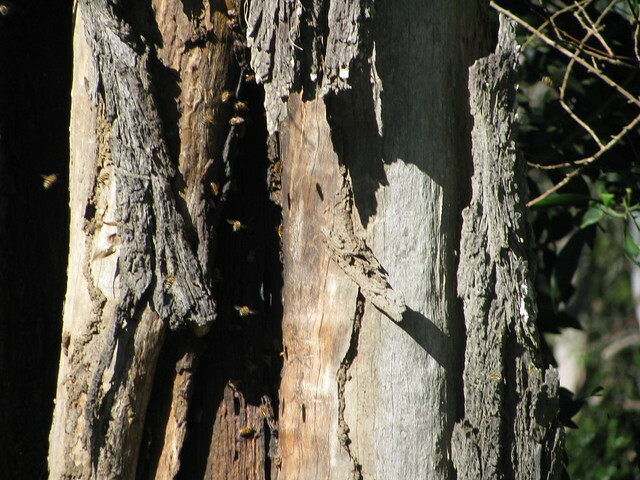 Wild bees have built a hive in the trunk of an old Eucalypt along Strong Road at Dayboro. All up, 55km, 2,500kcal (= 6 Big Macs), and 800m of ascent. A fantastic way to spend a Sunday afternoon! Wow neil. That looks like a really awesome ride. And so nice of that guy to let you look around without getting funny with you for being there. Thanks Em. Farmers are usually pretty nice. I was on his property, but I wasn’t sure, so I just approached him and explained that I wasn’t sure about whether I was on his land. I was delighted with his response. It could have been totally different if I just blindly rode on and didn’t think about whose land it was. I think I’ll make sure I bear that in mind next time!